Origin and Habitat: Sedum stahlii occurs in Mexico in the northeastern portion of the Sierra Madre del Sur and on the adjacent slopes of the Trans-Mexican Volcanic Belt, it also occurs on rocky slopes at Esperanza. Type locality: on limestone in the Canada Istapam near Tehuacan, Puebla. Habitat and ecology: This species usually grows in steep rocky slopes on limestone, but sometimes on conglomerate if the pH is neutral or above, often together with Sedum dendroideum, Sedum hemsleyanum, and Sedum lucidum. Altitude range: 2,100-2,450 metres above sea level. Description: Sedum stahlii is an evergreen succulent groundcover that forms loose mats to 30 (or more cm across) by 5-25 cm tall. This plant is easily recognized for its thick, egg shaped leaves (often considered bead shaped), which are opposite, dark red to russet green and grow on trailing stems. The leaves drop off almost as soon as you touch them, which then root rapidly. The flowers are star-shaped bright yellow with greenish vein and appear in late spring to early summer. It looks to be a variation of the common "jelly bean plant" (Sedum rubrotinctum), and is known by it's common name of "coral bells". Only Sedum obcordatum, regularly has opposite leaves, but the leaves of that are flat, obcordate, and glaucous, not terete, globular or elliptic-oblong, and hairy, as in S. stahlii. Stems: Much branched, spreading or trailing, reddish brown, finely pubescent, with hairs 0.3-1 mm long, frequently with aerial roots. Leaves: Dense, very turgid, decussately opposite, rarely subopposite or even alter­nate, elliptic-oblong, elliptical, or globular, rounded at apices, jellybean-like, terete in cross section, 12 by 4 mm, ovoid, shining, finely pubescent, dark- green, light pinky-brown to a deep rich brown, detaching very easily. Inflorescences: Two-forked terminal cymes of 2-6, usually 3, cincinni. Flowers: Few, short pedicellate, ca. 12 mm across, usually with five petals (rarely 4 or 6). Sepals lanceolate, oblong-lanceolate, or ovate, acute, un­equal, yellow-green, and puberulent. Petals elliptic-lanceolate, acute or acuminate, mucronate-appendaged, canary-yellow, sometimes minutely connate basally. Stamens have yellow filaments and anthers; pollen is well de­veloped. Nectaries subquadrate, rounded or concave at apex, deep yellow or orange. Pistils erect and yellow. Seeds: Ovoid, finely papillose, brown. Cultivation and Propagation: Sedum stahlii has a beautiful red/green foliage (more red when in full sun). 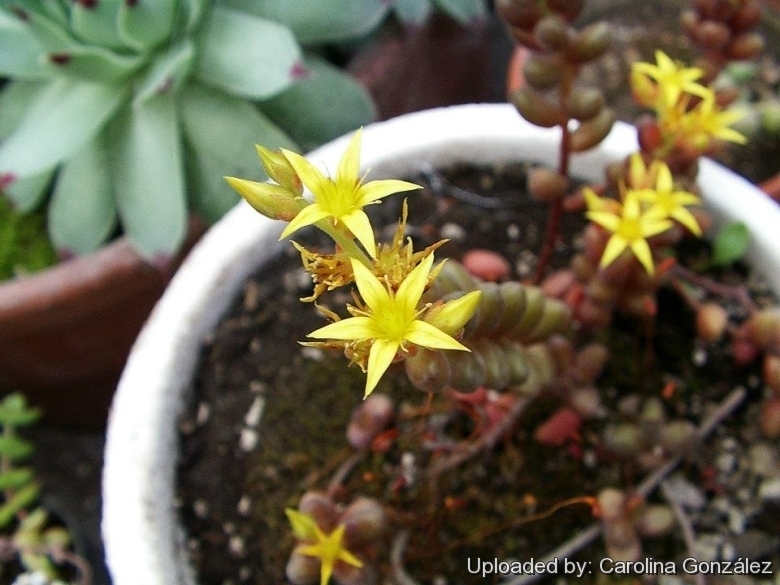 It is an easily grown succulent with that can tolerate sun, shade, moist soils, dry soils, but looks its best only when given adequate light levels and water, and ideally should be grown outdoors in full sun. S. stahlii is cultivated as an ornamental plant, it makes a superb container plant in frost-prone areas and can be an attractive part of rock gardens between stepping stones or in wall niches in frost-free localities. With its extreme drought resistance, S. stahlii needs only minimal care to reward you with its attractive jelly bean texture, bright red summer leaves and yellow flowers, although attractive, it can become a nuisance as the leaves fall off and produce new plants wherever hit the ground. These form dense mats quickly-somewhat trailing. Excellent for ground cover and landscaping. Exposure: Generally speaking, the more light a plant gets the better it will display its colours and shape. Bright light is required to prevent "stretching" of Sedums ("stretching" occurs when a moderately fast growing plant such as an Sedum, is grown in dim light or over-fertilized, which causes overly lush growth that contributes to weak, pallid plants). However, when moving plants from lower light conditions into full sun, be wary of sun scorch resulting from too rapid a transition into intense summer sunlight, most easily avoided by ensuring plants are well-watered before moving them on a cloudy day. Hardiness: Can tolerate light frosts however, the ideal temperature range during the summer growing season is 5-25°C, with the cooler autumn temperatures tending to make their foliage colours become more intense than those of the active summer growing season. Warning: Causes stomach irritation if ingested; skin irritation from sap contact.